Chickens, it is officially Fall and I am THRILLED. Fall is my favorite season. It means football, and falling leaves, and the disappearance of humidity related hair disasters. It means a return of sweaters and boots and cute jackets. It means ticking down to Thanksgiving, which, as you all know, is my singular most important day of worship at the altar of home cookery. And for those of you who are new? You might want to pop over HERE and check it out. Having said that, there is one thing about Fall that I don't particularly appreciate. The minute the heat breaks and the first cool breeze wafts through, the world seems to lose its mind and everything on the planet is suddenly "Pumpkin Spice" flavored. 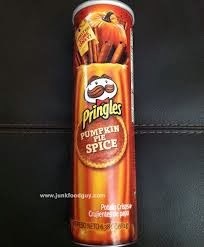 Which, let us be clear, is almost never ACTUALLY flavored like pumpkin, but mostly flavored like spice. Not good spice. Not warming satisfying spice. Bottom of the stale spice drawer spice, mixed with sawdust. I like spice. I like the autumnal heat of ground ginger, the kick of cinnamon, a touch of clove. The subtleness of mace, transformative nutmeg. And I like pumpkin. Not a huge fan of pumpkin pie, but the flavor of pumpkin I find very pleasing. But I do not need everything I put in my mouth from September through December to taste like a Yankee Candle. Local bakeries making moist pumpkin breads and tender pumpkin muffins and crumbly pumpkin scones? That contain actual pumpkin? Go forth with your deliciousness. Big corporations whose "food" is mostly made of multisyllabic chemicals? Give it up. That crap is disgusting. And yes, I am looking at you Pringles. And if you combine the word Pumpkin with Coffee or Latte or Smoothie or any other beverage? GACK. I know I am about to get a flood of pumpkin spice latte fanatics who wait all year to gorge themselves on a cup full of creamy potpourri, but I can take it. Bring your ire. I will always contend that your taste buds are broken. It won't make me love you any less. But let me at least try to move you towards the light, may I? Because pumpkin? REAL actual grown on a vine pumpkin? Can be very delicious. It can even be delicious with some fresh spices. It is the very essence of Fall. But it isn't a "flavoring". For starters, I give you my famous Pumpkin Soup recipe. Anyone can do this, and the results are truly spectacular. It is a terrific first course for Thanksgiving, a fun mugful on Halloween, and the perfect way to begin a Fall dinner party. In a very large stock pot, sauté onions in butter till soft. Add fresh and canned squash or pumpkin. Put in enough chicken stock to cover by about 2 inches. If you want to make it vegetarian, use water. Cook over medium heat till very soft, about 35-45 minutes. Blend with immersion blender or in stand blender till very smooth. For extra velvety soup strain thru chinois or fine strainer. Add cream and season to taste with salt and pepper, espelette if you like and fresh nutmeg. Blend together and scoop on top of soup. Cream melted butter with the sugars until smooth. Whisk in the vanilla and pumpkin and egg until smooth. Set aside. In a large bowl whisk all of the dry ingredients and spices together. Pour the wet ingredients into the dry ingredients and mix together with a large spoon or rubber spatula. The dough will be very soft. Fold in chocolate chips until well dispersed. Cover the dough and chill for at least 3 hours, or up to 3 days. Scoop 2 Tablespoons of dough for each cookie, roll into a ball between your hands (grease your hands if you like). Flatten the dough balls because the cookies will only slightly spread in the oven. Bake the cookies for 8-10 minutes. They will look slightly underbaked at this stage, but as long as the chips look melted and there is a crispy outside, they should be finished, and you want them chewy. As soon as you take the pan out of the oven, give it a sharp whack on the counter which will help flatten the cookies even more. Allow the cookies to cool for at least 10 minutes on the cookie sheets before transferring to a wire rack. Cool at least 30 minutes to an hour before eating. Anyone else have any favorite pumpkin recipes to share? When I lived in France, I was lucky enough to have a host dad who is a fabulous cook. There was another American student living there and we both looked forward to dinner every night. One night we were quite hungry and chatting about how we couldn't wait for dinner. Upon walking down the stairs, we were greeted with a horrible odor...it was pumpkin soup that M. Crabbe had made (usually we started with a green potage, but he had finally cut into the pumpkin on the top of the fridge). We choked it down the first night, and it got easier as the days went by (soup was an on-going project chez Crabbe). After about a week, we loved the pumpkin soup. Now just the mention of pumpkin soup reminds me of M. Crabbe, Besancon, and the kitchen where we ate so many delicious meals...and M. Crabbe would toss our water over his shoulder into the sink and give us wine about halfway through the meal, whether we wanted some or not... Thanks for the memory and the recipe. The pumpkin cookies may just need to go on my dessert table! Preheat the oven to 375 degrees. Cut the squash in half. Remove the seeds, drizzle with olive oil, salt and pepper. Lay cut side down on parchment lined baking sheet. Roast the squash until soft—30 minutes or so. Scoop the flesh of the squash out and place it in the food processor. Puree until completely smooth. Mix the pureed squash with parmesan cheese, salt, pepper and eggs. Then add the flour into the mixture and work together by hand. It will be very sticky. Once smooth, flour work surface, Divide dough into 6 pieces and then roll each piece into a long strip, about ½ inch wide. Cut the strip into ¼ to ½ inch pieces. Using a gnocchi board, a fork, the back of a grater or just as is to create ridges. Place each piece on the floured wax paper and repeat with the rest of the dough. Bring a large pot of salted water to boil. Boil until all the gnocchi floats—about 5 minutes. While gnocchi is cooking have your sauces ready so you can toss right in, if not you can freeze them single layer on a baking sheet, when frozen place into bags. and then RIGHT below this comment window, there's a Target ad for $1.00 off Pumpkin spice M&Ms (I tweeted you a screen shot). Is that ironic or coincidental? I always get those mixed up. To the left of your post. I don't know what's wrong with me today...Geez.